The ‘most exciting 2 minutes in sports’ in the American calendar is the Kentucky Derby, in the UK the Epsom Derby though it is the Royal Ascot Races which is more popular as the Queen attends it every year. 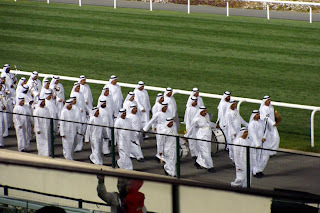 In UAE we have the Dubai World Cup, a thrilling by-invitation only horse racing championship held at the Meydan race course. 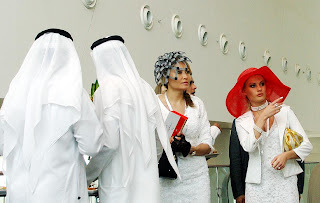 The brainchild of the Ruler of Dubai Shaikh Mohammad, the Dubai World Cup is in its sixteenth year now and remains a fitting tribute to his love of horses and horse-racing. 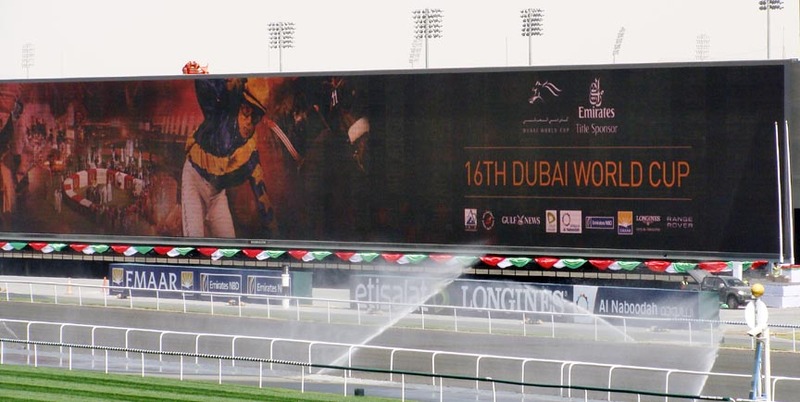 The Dubai World Cup 2011 had been grabbing all the attention the whole of last week with even the world cup cricket news coming a poor second in the sports pages. 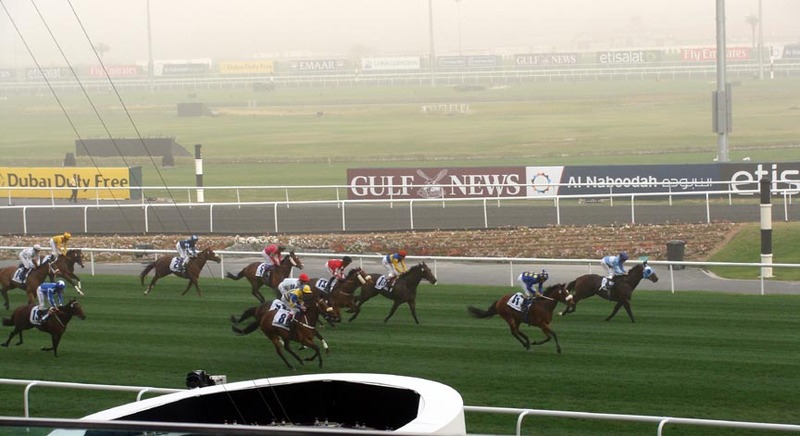 A fantastic 8 hour extravaganza last saturday had all the glitz of a bollywood movie……it had action, derama, emotions and masala, lots of masala and it culminated into a exciting finish with Japans Victoire Pisa galloping first past the finish line to take home a prize money of US $6 million of the total prize of US $10 million. The winning jockey was brilliant on the horse inspiring the animal from a bad start[the horse had hit its head on the starting gate just minutes before the race] to the forefront. ﻿And how does Nancy know all this???? 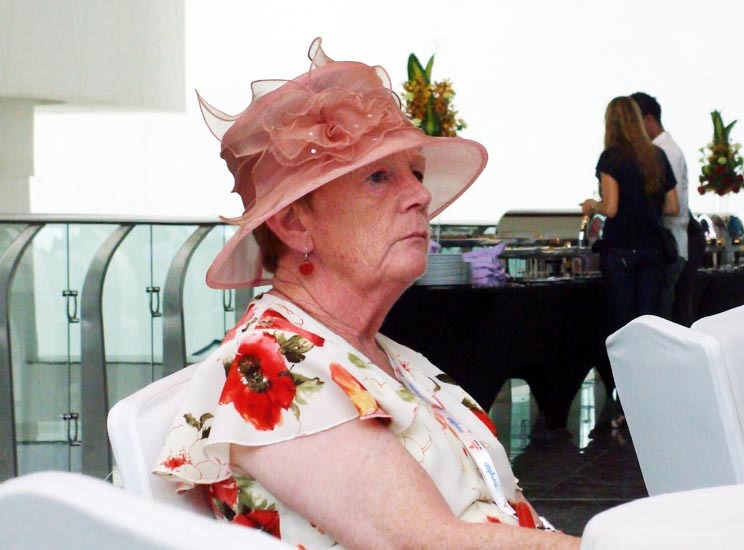 She reads the papers ofcourse, keeps eyes and ears open AND………she was KEY witness to the whole event. 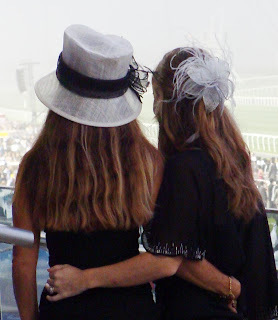 The better-half & she went for the Races on saturday and she just can’t stop crowing about it. 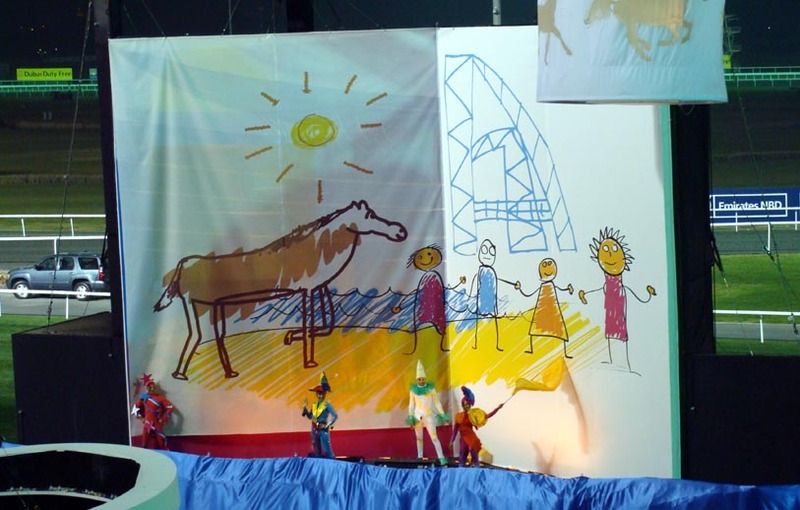 Upto 2 weeks back, what she knew about horses could be written on a single piece of paper which is Black Beauty, colt, big, filly, pony-tail, bill from Malory towers, horse-shoe, the highwayman, trot, gallop….well ok make it ¼ sheet of paper. But now you better treat her with a little more respect. 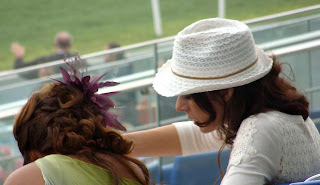 She can give you history, statistics & tips on which horses to place your bet on. Why, even yesterday except for Kinsale King almost all the horses she predicted as winners…..ummm lost miserably;-D….but that doesn’t mean anything, even the most seasoned horse enthusiasts sometimes get them wrong you know. I gave the 1st two races my all but after that my attention started wandering. The thing is, there is around an hour's gap between each race and how long could one be glued to the guidebook they provided. 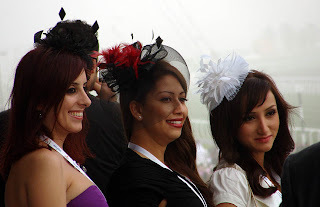 Shifting focus, I started clicking all the women who were dressed so elegantly with the traditional head gear associated with these do’s. 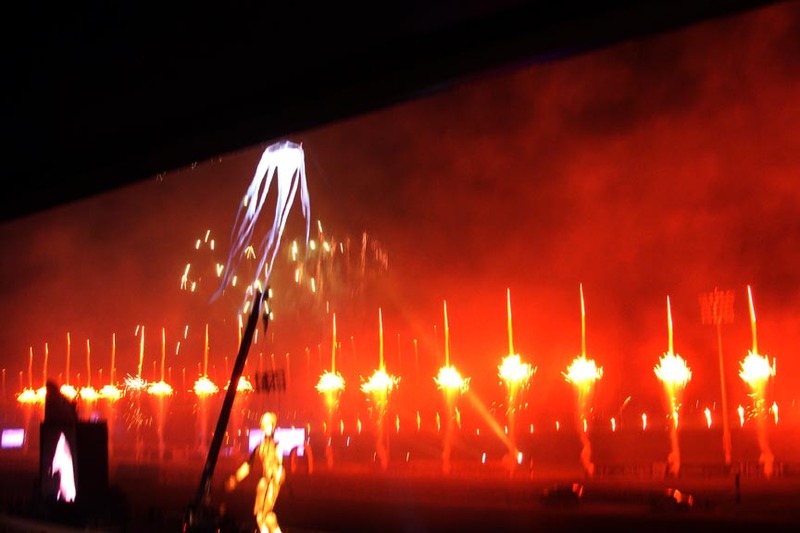 Here have a look….. 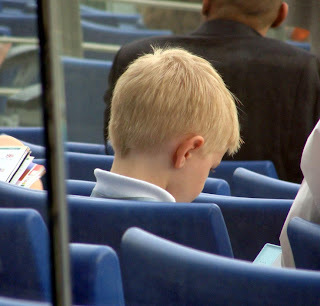 Very few children were seen about & the only one I spied was busy playing some gadget. Towards the later part of the evening there was a beautiful stageshow in the form of a float with the history of UAE and their connection with horses interweaved. There were also contests held for the best dressed woman, best hat, best couple and goodness knows what else with some fabulous prizes. If interested, you can view them all here. And amazing fireworks, though I got the feeling it was a bit toned down this year. For the first time I wished I had a DSLR to capture the fantastic effects. An evening well-spent, I went to sleep that night with a beautific smile on my face:-). Next post coming on it? Where did you leave the girls, woman ???? The girls were spending the day with their friends. They didnt really care as we had gone for the qualifiers the previous week and they didnt find anything of their interest there. Thank goodness for that;-D.
Horses and i can just say black beauty, highwayman and riding riding riding.. ok thats again from highwayman. You can fill some bit of a page which is amazing! Wow. This is a side of N we never knew. A racing afficiondo ?? Welcome to the sport of kings. 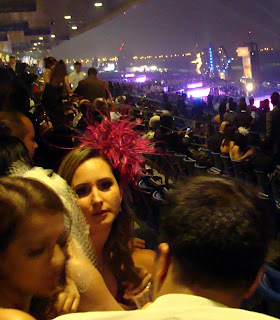 Much envious that you actually went to the Dubai World Cup. A great race and is truly a World Cup as it brings the best of America and Europe together usually. 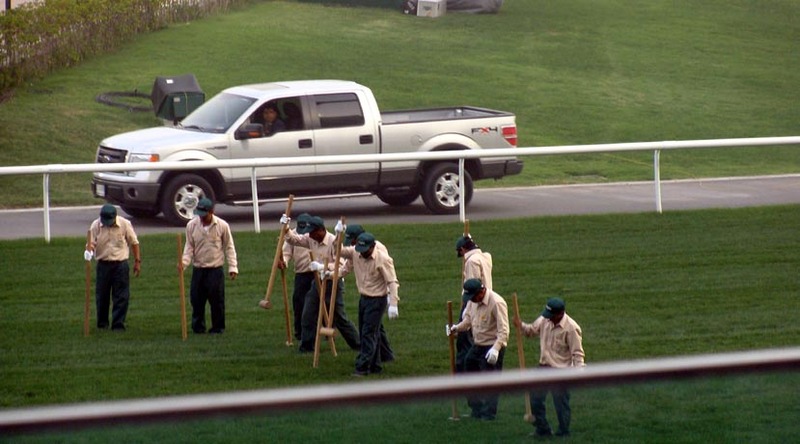 Not surprising since Sheikh Mohammed owns half the horses anyway. 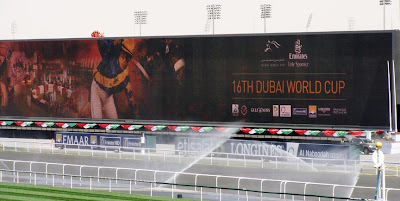 Perhaps very apt that a Japanese hose won for the first time this year. wow what an experience! :) lucky you! all we ve seen are in pictures/movies!! :( mustve been real interesting and absorbing, and very english?! came to take a peek and look what i got! 2 posts! engaging post. arab horses are the best in the world and it is a fitting place for such a show. cool that you went to see it. can't believe people still dress like that! very festive. good to have ya back nance. Yeah the hats are almost like traditional tho nowadays hats are replaced by hair pieces. Sulo: Hehehe geography was one of my favourite subjects. Honestly I rarely take pictures of myself or let others take them, dunno why but I yam like thaat vonly;-D.
DialoguewithU: Oh yes the dressing up is the toughest. The tabloids had interviews with women who detailed their search for the perfect dress, shoes & hat...each took a huge column in the paper to explain;-D.
Ramesh: Actually betting is considered illegal here tho they do have 2 above-aboard selections wherein we dont pay up or anything but if we make the right choices of horses we stand to win a solid amount. But I've hrd there's lot of betting happening under the table;-D.
Lan: It was like a carnival and drinks made them all loosen up....not like shady or anything but fun;-D. Pity we were observing lent;-(!!!!! Excellent post!!!!!!! You are indeed BACK. 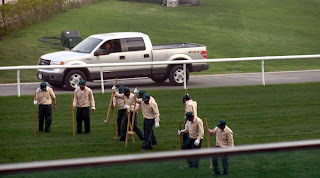 I just absolutely loved the facts...but best of all the pics of the hats and head gear. Had to smile at the waiter hoovering over your table. So you are back to your blogging ways again ... Mabrook!! 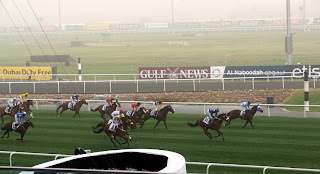 Interesting piece on the Dubai Derby ... nice pics too! Thanks for visiting my blog - I had visited the Bird place even before I wrote Part - 1; just kept the report for a later date .. now its up too. I still have not got a hang of replying to a comment on my page - it couldn't come to you, right? J: LOL no it wdn't;-D!!!! And shukran;-D!!!! Horses always take me back to Bill and her 7 brothers !!!! Souls Speaks: Good to see u too;-D!!! My dear Sulo, u r so sulo...err I mean silly[hehe cdnt resist tht;-D] ofcourse i knew it was U but since both comments were on different subjects i thot it makes better sense to put them separately, got ittttt??? Woah!!! Didn't know you were alive :P and here you are enjoying horse races and all. Cool! Rakesh: Betting is illegal didnt u knw;-o....but yeah there were 2 pick & choose kind of bets which had a fixed amount as prize...and nope didnt win anything;-(. Hehe Colours u said it, not me;-D!! !